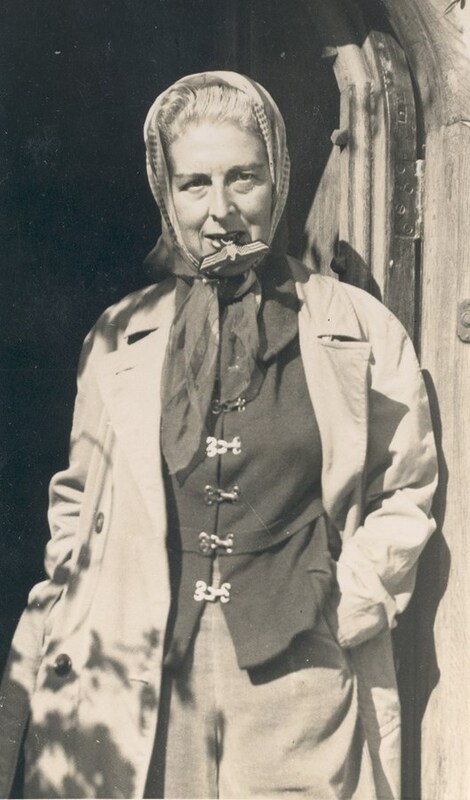 Claude Cahun was born today, October 25, in 1894. She was a French artist, photographer, and writer. Her work was both political and personal, and often undermined traditional concepts of gender roles. Born in Nantes as Lucy Renee Mathilde Schwob, in 1894, Cahun was born into a provincial but prominent intellectual Jewish family. Cahun was the niece of an avant-garde writer Marcel Schwob and the great-niece of Orientalist David Léon Cahun. When Cahun was 4 years old, her mother, Mary-Antoinette Courbebaisse, began suffering from mental illness, which ultimately led to her permanent internment at a psychiatric facility. Due to the absence of her mother, Cahun was brought up by her grandmother, Mathilde Cahun. Cahun attended a private high school in Surrey after experiences with anti-Semitism at her high school in Nantes. She attended the University of Paris, Sorbonne. She began making photographic self-portraits as early as 1912 at aged 18, and continued taking images of herself through the 1930s. 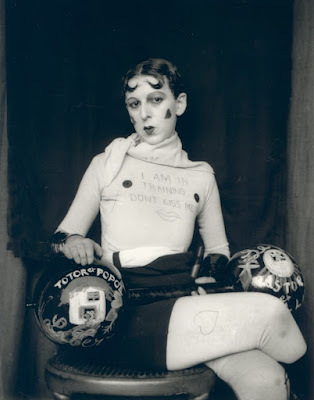 Around 1919, she changed her name to Claude Cahun. During the early 1920s, she settled in Paris with her lifelong partner and step-sibling Suzanne Malherbe, who adopted the only slightly less equivocal pseudonym "Marcel Moore." For the rest of their lives together, Cahun and Malherbe collaborated on various written works, sculptures, photomontages and collages. The two published articles and novels, notably in the periodical Mercure de France. Cahun's work encompassed writing, photography, and theater. She is most remembered for her highly staged self-portraits and tableaux that incorporated the visual aesthetics of Surrealism. During the 1920s, Cahun produced an astonishing number of self-portraits in various guises such as coquette, body builder, skinhead, vamp and vampire, angel, and Japanese puppet. Her published writings include "Heroines," a series of monologues based upon female fairy tale characters and intertwining them with witty comparisons to the contemporary image of women; Aveux non-avenus, a book of essays and recorded dreams illustrated with photomontages; and several essays in magazines and journals. In 1932 she joined the Association des Écrivains et Artistes Révolutionnaires. Following this, she started associating with the surrealist group, and later participated in a number of surrealist exhibitions, including the London International Surrealist Exhibition and Exposition surréaliste d'Objets in Paris, both in 1936. Cahun's photograph of Sheila Legge standing in the middle of Trafalgar Square with her head obscured by a flower arrangement with pigeons perching on her outstretched arms from the London exhibition, appeared in numerous newspapers and later reproduced in a number of books. In 1934, she published a short polemic essay, Les Paris sont Ouverts, and in 1935 took part in the founding of the left-wing group Contre Attaque, alongside André Breton and Georges Bataille. In 1937 Cahun and Malherbe settled in Jersey. Following the fall of France and the German occupation of Jersey and the other Channel Islands, they became active as resistance workers and propagandists. Fervently against war, the two worked extensively in producing anti-German fliers. Many were snippets from English-to-German translations of BBC reports on the Nazis' crimes and insolence, which were pasted together to create rhythmic poems and harsh criticism. The couple then dressed up and attended many German military events in Jersey, strategically placing them in soldier's pockets, on their chairs, etc. Also, they inconspicuously crumpled up and threw their fliers into cars and windows. In many ways, Cahun and Malherbe's resistance efforts were not only political but artistic actions, using their creative talents to manipulate and undermine the authority which they despised. Cahun's life's work was focused on undermining a certain authority, however her specific resistance fighting targeted a physically dangerous threat. In 1944 she was arrested and sentenced to death, but the sentence was never carried out. However, Cahun's health never recovered from her treatment in jail, and she died in 1954. Cahun worked for herself and did not want to be famous. It wasn't until 40 years after her death that Cahun's work became recognized, mostly thanks to François Leperlier. In many ways, Cahun's life was marked by a sense of role reversal, and her public identity became a commentary upon the public's notions of sexuality, gender, beauty, and logic. Her adoption of a sexually ambiguous name, and her androgynous self-portraits display a revolutionary way of thinking and creating, experimenting with her audience's understanding of photography as a documentation of reality. Her poetry challenged gender roles and attacked the increasingly modern world's social and economic boundaries. Also, Cahun's participation in the Parisian Surrealist movement diversified the group's artwork and ushered in new representations. Where most Surrealist artists were men, and their primary images were of women as isolated symbols of eroticism, Cahun epitomized the chameleonic and multiple possibilities of genders and of the body. Her photographs, writings, and general life as an artistic and political revolutionary continue to influence countless artists. 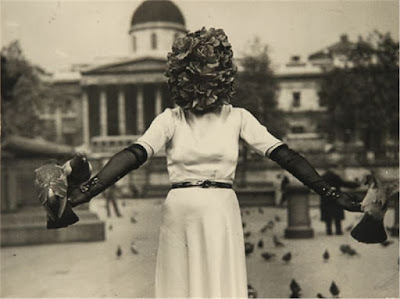 In 1994 the Institute of Contemporary Arts in London held an exhibition of Cahun's photographic self-portraits from 1927–47, alongside the work of two young contemporary British artists, Virginia Nimarkoh and Tacita Dean, entitled Mise en Scene. In the surrealist self-portraits, Cahun represented herself as a dandy, androgyne, nymph, model and soldier. You could call her transgressive or you could call her a cross dressing Man Ray with surrealist tendencies. I find this work really quite mad, in the nicest way.